Sad story and true. And people complain if you impose some small park fee to raise money to help pay for rangers etc. Sad, parts of the park are being torn up. I worry about the resources being abused and trashed. Even with the full ranger staff there was too much abuse of the area. Wow. This is shocking. I'd rather have a full staff at all the parks than a half built high speed rail system, but that's just me. 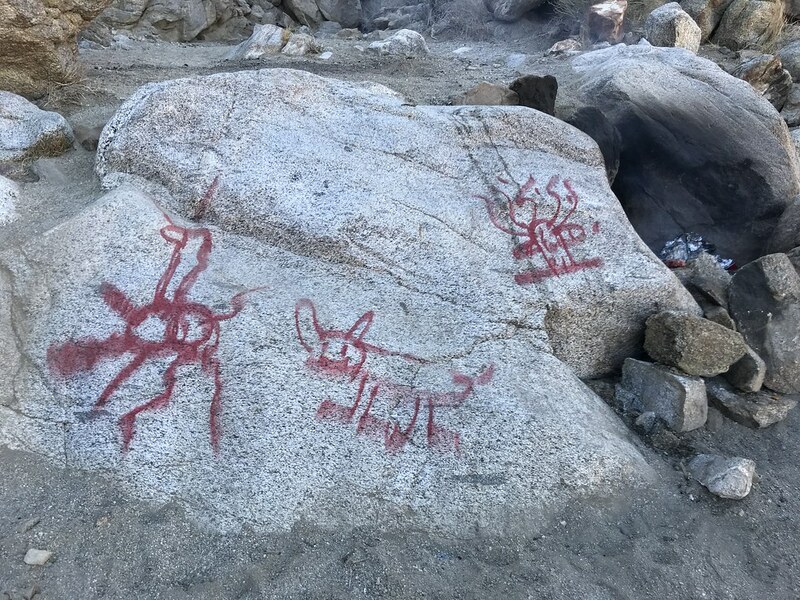 There was a disturbing amount of litter, graffiti, vandalism, and campfire damage in a couple places recently. I don’t know if it is due to less Rangers or more idiots or a combo of both. What areas are people finding the most trash and vandalism? Culp Valley, Old Culp Valley rd, The Slab, Dos Cabezas, Mortero Palms, Plum Canyon. This was all in mid July to early August. 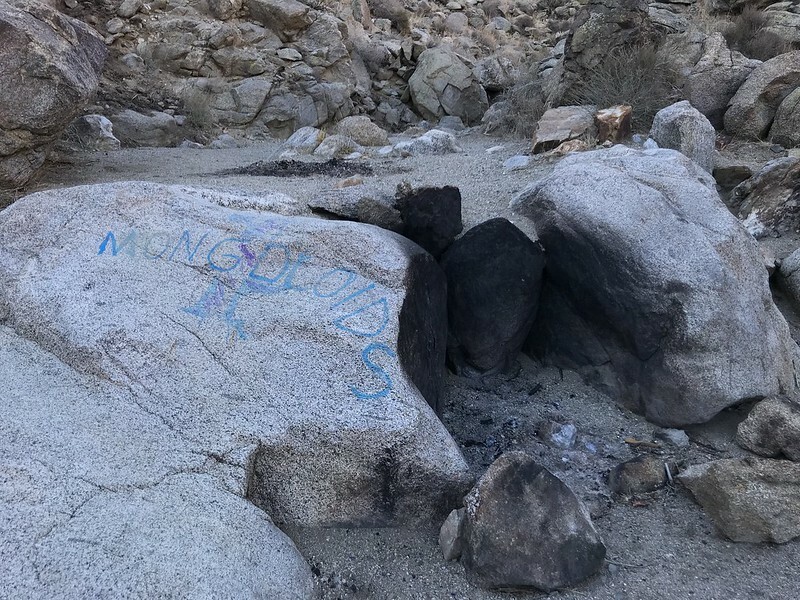 I revisited Plum Canyon a couple weeks later and found someone had mostly cleaned up the graffiti and filled in the illegal fire ring. I picked up some trash. Didn’t have room for it all. Thanks, I’ll try to see who has adopted those areas for Adopt a Wash/Trail. One terrible example. This graffiti was scrubbed mostly clean a couple weeks later and the fire ring filled in. Lots of stuff like this in various areas. Thanks for helping keep it clean. Note- The BP also says they are finding more illegals armed with AK's and AR's...so be aware out there. Was the trash blanket shoes, water jugs and empty cans of atune (tuna)? Most of the trash I have seen is from idiots. Travelers sin documentos don’t bring couches, old car tires, spray paint, glass beer bottles to abandon, shoot at, or throw in a fire. As mentioned above, it is easy to see if it is from border crossers due to the contents. I’ve definitely found this kind of litter as well though. 4 new Rangers now on the job. They are not from here, so we will see how it goes. Their web site mentions a $10 entrance fee collected at the visitor center. I was recently at Death Valley NP, and they had kiosks set up at the park entrances to collect entrance fees. Seems as if similar kiosks at ABSP would be a small investment for a larger return to hire more rangers.